I’m now convinced that both Miuccia Prada and Karl Lagerfeld (see Chanel’s haute couture show for Spring/Summer 2012) are fans of Pan Am. 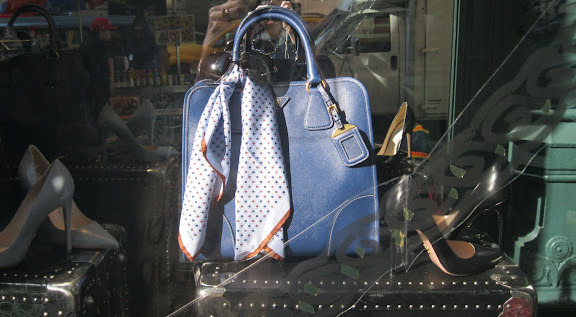 I took these pictures today at the Prada store in SoHo at Prince Street and Broadway, and my my my, these look like something Christina Ricci as Maggie Ryan would carry right on board with her to work a transatlantic flight to Milan! Christina Ricci as Maggie Ryan on Pan Am. Photo from The Sun. Can’t you just see this entire ensemble on Maggie’s arm? As I am a big fan of 1960s and 70s stewardess culture I love every bit of these ladylike details and am swooning over the gorgeous bags, the silk scarves, the aviator sunglasses, and the high-heeled pumps. And yes, that IS me, your intrepid photographer, right above the handle of the bag. Wow! That is a magnificent bag. Is that show still on? I've not seen it. Have heard mixed things. I am going to have to start tying scarves on my bags....looks so chic! This does look like Maggie Ryan would wear. I love most things from the 70s also. Love your corelation of Prada and Mr. Lagerfeld's recent flight influence. 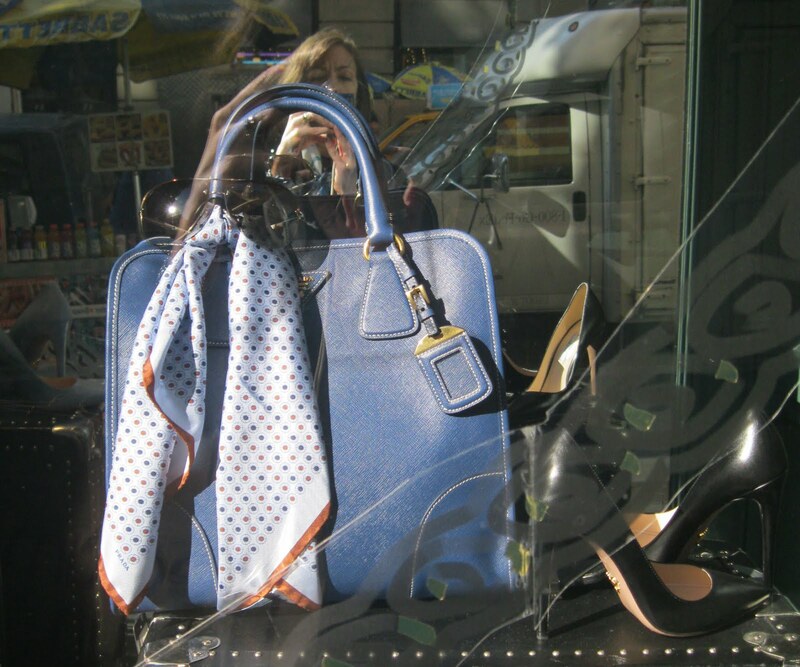 I'm admiring your reflection as well as the bag and scarf. It does look like the perfect bag for A flight attendant during that era. 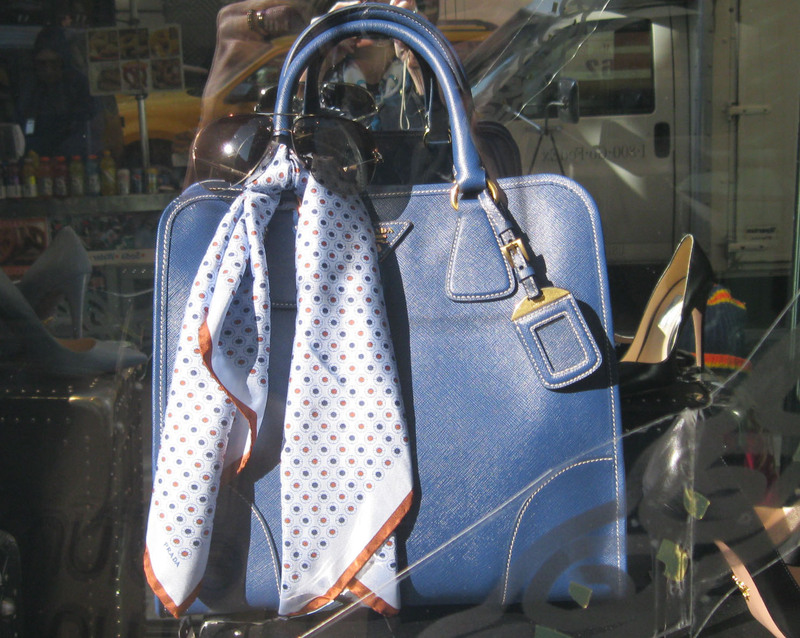 It looks like it was a fabulous day for window shopping. Thanks for you sweet comment. Yes, I can see you, soc close to prada. So gorgeous...I think just once I would love to own a fabulous bag such as this one..timeless, chic!